In vitro culture systems have proven indispensible to our understanding of vertebrate myogenesis. However, much remains to be learned about nonmammalian skeletal muscle development and growth, particularly in basal taxa. An efficient and robust protocol for isolating the adult stem cells of this tissue, the myogenic precursor cells (MPCs), and maintaining their self-renewal, proliferation, and differentiation in a primary culture setting allows for the identification of conserved and divergent regulatory mechanisms throughout the vertebrate lineages. Froehlich, J. M., Seiliez, I., Gabillard, J. C., Biga, P. R. Preparation of Primary Myogenic Precursor Cell/Myoblast Cultures from Basal Vertebrate Lineages. J. Vis. Exp. (86), e51354, doi:10.3791/51354 (2014). Due to the inherent difficulty and time involved with studying the myogenic program in vivo, primary culture systems derived from the resident adult stem cells of skeletal muscle, the myogenic precursor cells (MPCs), have proven indispensible to our understanding of mammalian skeletal muscle development and growth. Particularly among the basal taxa of Vertebrata, however, data are limited describing the molecular mechanisms controlling the self-renewal, proliferation, and differentiation of MPCs. Of particular interest are potential mechanisms that underlie the ability of basal vertebrates to undergo considerable postlarval skeletal myofiber hyperplasia (i.e. teleost fish) and full regeneration following appendage loss (i.e. urodele amphibians). Additionally, the use of cultured myoblasts could aid in the understanding of regeneration and the recapitulation of the myogenic program and the differences between them. To this end, we describe in detail a robust and efficient protocol (and variations therein) for isolating and maintaining MPCs and their progeny, myoblasts and immature myotubes, in cell culture as a platform for understanding the evolution of the myogenic program, beginning with the more basal vertebrates. Capitalizing on the model organism status of the zebrafish (Danio rerio), we report on the application of this protocol to small fishes of the cyprinid clade Danioninae. In tandem, this protocol can be utilized to realize a broader comparative approach by isolating MPCs from the Mexican axolotl (Ambystomamexicanum) and even laboratory rodents. This protocol is now widely used in studying myogenesis in several fish species, including rainbow trout, salmon, and sea bream1-4. Considerable understanding of mammalian myogenesis has been obtained through the recapitulation of this process in both primary mouse (Mus musculus) myoblast cultures and the well-described mouse-derived cell line, C2C125. Beginning in the 1950s6, these cultures have led to much advancement in the understanding of the murinemyogenic program and, by extension, myogenesis in other vertebrates. Additionally, single cell myofiber explant techniques have increased out understanding of interactions between satellite cells and surrounding myofibers7-9.Cell cultures are particularly attractive for investigations of myogenesis due to the short time from precursor to differentiated cell10, relative ease of transfection for RNAi11-14, transgenic15,16 and overexpression studies14,17,18 , in vitro expansion followed by in vivo transplantation18-20, and even comparison of myogenic precursor cells and their regulating agents across taxa21,22. While differences due to the artificial environment of the culture system have been described5,23 , these in vitro systems have proven to be indispensible to our dissection of the intricate program governing the formation of multinucleated, terminally differentiated myofibersfrom mononucleated proliferative progenitor cells known as myosatellite cells (MSCs) among the mammals. Outside of the class Mammalia, however, the conservation and/or divergence of mechanisms controlling myogenesis are poorly understood, largely due to the difficulty in culturing myogenic precursor cells (MPCs) and myoblasts from various taxa. Indeed, primary myoblast cultures have only been described in three birds24-26, one reptile27, a few amphibians28-30, and some fishes1,3,4,31-33. Continuous myogenic cell lines from vertebrates other than rodents34-36are even more rare, with the only non-mammalian myogenic cell line being derived from Japanese quail (Cortunix japonica), QM737. Despite many attempts at immortalization, a teleost myogenic cell line remains elusive and a protocol for efficient transfection of these cells was only published this year15. Thus, clear and well-optimized protocols for culturing primary MPCs and myoblasts from a variety of vertebrates are very much needed to not only further expand our knowledge of the evolution of the myogenic program, but to employ the power of comparative physiology to make breakthroughs in the treatment of human skeletal muscle diseases and disorders. While the literature contains many reports of MPC/myoblast isolation38-49, it is common for authors to describe the protocols for such isolations in brief, often incomplete, formats. Further, the most instructive protocols reported have been developed for mice50-53, and some of these rely on antibody selection54,55 or fluorescence transgenes56,57, making these protocols unusable or impractical inmost non-rodent species utilized by muscle biologists. With little known about piscine, amphibian, and reptile myogenesis, a detailed and thorough protocol, described with audiovisual guidance and with demonstrated efficiency in distantly related species, would be most helpful to the field. First described by Powell and colleagues in 198958, the following protocol was initially developed to isolate MPCs and myoblasts from salmonid fishes (namely, rainbow trout, Oncorhynchus mykiss, and Atlantic salmon, Salmo salar) and some larger cyprinids (i.e. goldfish, Carassiusauratusauratus). In 2000, Fauconneau and Paboeuf optimized a primary myoblast culture for rainbow trout59, and minoroptimizations made that protocol utilizable in several smaller minnows of the Danioninae clade (zebrafish, Danio rerio, and giant danio, Devario aequipinnatus)32 due to the many genetic tools available for zebrafish work and thus its close relatives. Teleost fish are attractive organisms for study due to their divergent growth strategy (at least in most species). Large salmonids, like most fishes, grow indeterminately, with growth potential unfettered by an asymptote at maturity, even in old age60-62. Unlike zebrafish, large danionins such as the giant danio63 and moustached danio display growth potentials typical of teleost fish, making their direct juxtaposition an ideal platform for understanding whether MPC cell fate choice plays a role in skeletal muscle hyperplasia versus hypertrophy. Likewise, we have demonstrated that this protocol can be used with mice and axolotls, with relatively high cell yield and viability indices. Urodele salamanders, such as the Mexican axolotl (Ambystomamexicanum),possess the remarkable ability to regenerate tissues, including entire limbs and tails64-66. This characteristic makes these amphibians interesting models of skeletal muscle wasting and aging. Using the protocol described below, a similar approach can be undertaken as has been done in many fish species, providing an even wider comparative context for such studies. As many truly comparative biologists appreciate, the most meaningful advances in basic biology and translational biomedicine can be made when data are analyzed within the widest spectrum (here, the entire vertebrate lineage). Ethics Statement: All experimentation involving vertebrate animals described herein was approved in advance by the Institutional Animal Care and Use Committee of the University of Alabama at Birmingham and is consistent with guidelines established by the Office of Laboratory Animal Welfare, National Institutes of Health of the U.S. Department of Health and Human Services. Prepare the base medium as follows: 9 mM NaHCO3 (1.51 g per 2 L), 20 mM HEPES (9.53 g per 2 L) in DMEM (13.48 g/L; 26.96 g per 2 L). Determine pH and adjust to 7.40 with HCl or NaOH. Determine osmolality and adjust to ~ 300 mOsm with NaCl (if needed). Filter sterilize using (2) 1 L vacuum sterilization systems and store at 4 °C protected from light for up to 2-3 months. NOTE: See Tables 1 and 2 for complete reagent, tools, consumables, and equipment information. Prepare poly-L-lysine-treated plates by dissolving 5 mg of γ-irradiated poly-L-lysine (> 300,000 mw) in 50 ml of ultrapure sterile water. Mix gently by inversion for 10 min at room temperature, ensuring full dissolution of lysine polymers. Pipette the necessary amount of poly-L-lysine solution into each well, according to the plate type (Table 3). Allow plates to stand in laminar flow hood for 5 minutes. Next, remove poly-L-lysine solution and wash twice with sterile water. Allow plates to air dry in laminar flow hood for 20 minutes. Gently swirl the solution to ensure full well coverage. Seal plates with laboratory tape and place in incubator for 24 hours. The incubator should be set to appropriate temperature for species being used (see Table 7), and no additional gases need to be added to incubator. NOTE: Laminin must be allowed to adhere to plates for 24 hours before seeding cells. Failure to do so will result in poor to no cell adherence. Prepare media as described in Table 4. Complete media is best prepared the day of use. In preparation for tissue isolation, assemble the following items and autoclave: 300-500 ml beaker(s); glass Petri dishes; scalpel handles; forceps (fine and coarse); dissection scissors; and several sheets of water-repellant autoclave paper. NOTE: For each person assisting with the dissection process, (2) scalpel handles, (1) forceps (type depending on personal preference), (1) dissection scissors, and (5-10) sheets of water-repellant autoclave paper are sufficient. In addition to the autoclaved items above, assemble 70% ethanol, a weight balance, sterile 50 ml conical tubes (number depends on size of culture), and ice. Before beginning, ensure that a sufficient stock of fish is available. NOTE: The age of the fish to be used is of critical importance. While fish of two different species may be of similar weights, a younger fish of one species will possess more MPCs than an older fish of another species. As a general rule, younger fish, especially when working with salmonids, are best. For danionins, fish as old as one year can be utilized optimally, while salmonids of age 4-6 months or younger (up to 15 g) are optimal. For each 5 g of tissue to be dissected, aliquot 25 ml of isolation medium into a sterile 50 ml conical tube. Weigh, record mass, and number the tube(s). Place tubes on ice. Euthanize 2-3 fish at a time by immersion in > 300 mg/L sodium bicarbonate-buffered tricaine methanesulfonate. Allow opercular movement to cease for > 5 minutes and then submerse fish in 70% ethanol (contained in the sterile beakers) for 30 seconds. Remove fish from 70% ethanol and place on water-repellant autoclave paper. Directly behind the opercula, use a scalpel to make a superficial, shallow incision. Remove the scales and skin by grasping the skin at the aforementioned incision and pull toward tail of fish. Following skin removal, excise the epaxial, fast-glycolytic ‘white’ muscle of the fish from both sides (avoiding the slow-oxidative ‘red’ muscle located near the lateral line) and place in isolation medium. Discard the remainder of the fish as required by institution. NOTE: While it is entirely possible to culture MPCs originating from red muscle, nearly every publication using teleost MPCs has utilized cells isolated from the epaxial myotome. Repeat steps 2.4-2.6 until a sufficient quantity of muscle is obtained. During dissection, ensure that pooled muscle tissue remains on ice to maintain cell viability. Pour one tube of 25 ml/5 g of muscle tissue into a glass Petri dish. Using two scalpel handles with attached #10 scalpel blades, mince tissue to a slurry or purée consistency. 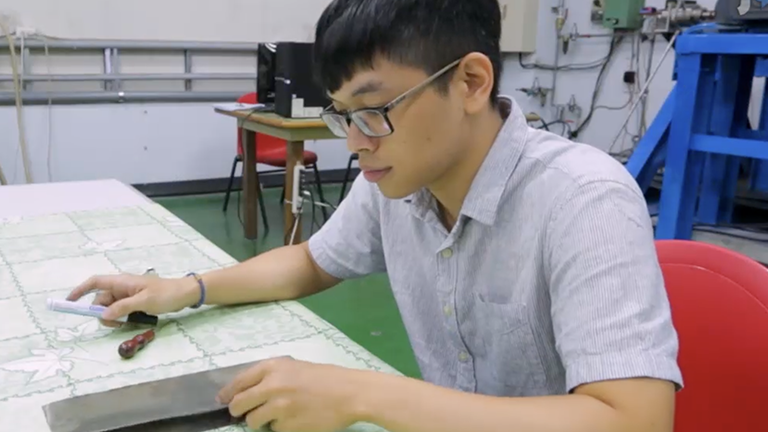 A “back-and-forth” motion of pulling the scalpel blades past each other works best. NOTE: While tissue homogenizers may seem appropriate, the number of viable cells will be dramatically reduced, if not abolished. Using a 25 ml serological pipette and serological pipettor, remove the slurried tissue and replace in the original conical tube. Repeat steps 3.1-3.2 until all tissue in all tubes has been mechanically dissociated. Centrifuge tissue for 5 minutes at 300 x g and 10 °C. Following centrifugation, discard the 25 ml of media supernatant with a 25 ml serological pipette, vacuum aspirator, or by careful decanting. Add 25 ml of wash medium to each tube, resuspend tissue, and recentrifuge as above. Wash twice with wash medium, removing the supernatant each time. During step 3.4, prepare collagenase solution by combining 0.22 g of Type IV collagenase and 44 ml of base medium (or sufficient quantity at 0.11 g/0.22 ml). Stir in a beaker for 10-15 minutes at 4 °C. Filter sterilize with a 50 ml syringe and a 0.45 μm syringe filter. NOTE: More than one syringe filter may be needed, depending on the collagenase preparation. Collagenase obtained from vendors other than Worthington Biochemical poses more difficulty during filtration. Collagenase is used to dissociate peptide bonds in collagen that constitute the endomysium. This digestion will remove that protective barrier of the myofibers. For each g of muscle tissue, resuspend tissue in a 0.2% collagenase solution. For 5 g of muscle tissue, add 10 ml of collagenase solution and 15 ml of base medium. Add 10 μl of PSF per ml of collagenase solution/base medium (e.g. 250 μl to 25 ml). Ensure that tissue is well suspended, as this will affect the efficiency of the enzymatic digestion. Incubate muscle tissue in collagenase for 60 minutes at 18 °C with gentle rocking. Depending on the degree of mechanical dissociation and species, collagenase digestion may be extended to 90 minutes, although this may affect cell viability. Following collagenase digestion, centrifuge conical tubes at 300 x g for 5 minutes at 12 °C. Discard the supernatant and resuspend tissue in 25 ml of wash medium. Recentrifuge at 300 x g for 5 minutes at 12 °C. Repeat with washing medium a second time. After washing tissue twice, resuspend muscle tissue in 25 ml of wash medium and triturate with a 10 ml serological pipette until the tissue/medium homogenate passes in and out of the pipette with relative ease. 5-10 triturations is usually sufficient. Repeat with a 5 ml serological pipette and then a 16 gauge metal cannula attached to a syringe. Centrifuge conical tubes at 300 x g for 5 minutes at 12 °C. Decant supernatant. During the above 5 minute centrifugation, prepare the trypsin digestion solution by combining 0.25 g of trypsin with 5 ml of base medium. Stir at 4 °C for 10-15 minutes and filter sterilize with a 20 ml syringe and 0.45 μm syringe filter. Retrieve conical tubes and add 100 μl of trypsin solution and 4.9 ml of dissociation medium for every 1 g of muscle tissue to every tube. For example, add 500 μl of trypsin solution and 24.5 ml of dissociation medium to 5 g of muscle tissue. NOTE: Trypsin is a serine protease that will separate myogenic precursor cells from the basal lamina. Resuspend tissue in the trypsin/dissociation medium well. Incubate for 20 minutes at 18 °C. Following the first trypsin incubation, centrifuge conical tubes at 300 x g for 1 min at 12 °C. Neutralize trypsin by combining the supernatants with isolation medium at a concentration of 1 volume of supernatant to 4 volumes of isolation medium. Store at 4 °C during the second trypsin digestion. To the remaining pellet of tissue, repeat steps 4.12-4.15, combining the supernatant following step 4.15 with the supernatant/isolation medium from the first trypsin digestion. ALTERNATIVELY: The collagenase and trypsin digestions may be combined to maximize cell yields. To do this, triturate the collagenase digest using a metal cannula (6 in length and 16 gauge works best) attached to a 20 ml syringe until the homogenate easily passes through the cannula. To the homogenate, add 500 μl of trypsin solution (prepared in step 4.10) and incubate at 18 °C for 20 minutes. Following the incubation, centrifuge conical tubes at 300 x g for 1 minute at 12 °C. Neutralize trypsin by combining the supernatants with isolation medium at a concentration of 1 volume of supernatant to 4 volumes of isolation medium. Store at 4 °C during the second trypsin digestion. Proceed with step 4.18 as with the standard protocol. Dispense the final supernatant/isolation medium mixture into 50 ml conical tubes and centrifuge at 300 x g for 10 minutes at 12 °C. Remove the supernatants taking care not to disturb the cell pellets. Pipette 2 ml of complete medium into each tube, dissolving each cell pellet. Combine cells suspended in complete medium in one 50 ml conical tube. Rinse each tube with 1 ml of complete medium, combining with the pool of cells resuspended previously. Triturate with a metal cannula and syringe 5-10 times. Filter cell suspension through a 100 μm cell strainer, rinsing with complete medium. Filter the cell suspension through a 40 μm cell strainer. Add sufficient complete medium to 50 ml and centrifuge at 300 x g for 10 minutes at 15 °C. Following the final centrifugation in step 4.25, remove supernatant by careful decanting or with a serological pipette. Resuspend the cell pellet in 5 ml of complete medium. With cells fully resuspended, remove 20 μl of the cell suspension and place in a 1.5 ml microcentrifuge tube. Add 5 μl of Trypan blue dye and wait 5 minutes. Using a hemocytometer, determine the number of viable cells. Upon determination, dilute cells to the needed concentration. Teleost MPCs are best seeded at 150,000-200,000 cells per cm2. For a six-well plating strategy, diluting cells to 1.5 x 106 - 2.0 x 106 per ml supports sufficient proliferation and differentiation. Retrieve poly-L-lysine-treated, laminin-coated plates and seed cells. (See Table 5 for plate-specific dilutions and plating volumes.) NOTE: Table 6 depicts average number of cells isolated per gram of muscle tissue isolated from various teleost species. Rainbow trout (O. mykiss) exhibit fewer MPCs per gram of muscle tissue than do zebrafish (D. rerio) and will thereby require more fish to isolate from for proper seeding. ALTERNATIVELY: Some laboratories have adopted a protocol that calls for allowing MPCs to adhere to the culture substrata for 40 minutes. Then rinse plates with washing media to remove any loosely attached and non-adherent cells. Warning: This step is very important to avoid “non-specific” adhesion of other cells (e.g. fibroblasts) to the culture substrata. Add complete media and place cells in the incubator and care for as detailed below. Twenty-four hours post-seeding, myogenic precursor cells (MPCs) should be visible attached to the laminin substratum (see Figures 1a and 1d). Following seeding, cells (MPCs) adopt a spindle-like shape, indicative of this cell type (Figure 1) and are MyoD1+ (Figure 2). In Danio species, MPCs appear to be more compact with smaller bipolar processes than do MPCs from Oncorhynchus and Salmo species. However, over four days of culture, MPCs from all piscine species examined adopt similar morphologies and look distinctly like myoblasts (Figures 1b and 1e). Complete media should be removed, and MPCs should be washed twice with wash medium. Myofibroblasts can contaminate myogenic cultures and are readily distinguishable from MPCs/myoblasts by their star-like morphology (versus the spindle shape of the myoblast). Washing of the plates greatly improves the removal of such fibroblasts. In the species described here (see Table 7), daily media changes produce the best results. MPCs and progeny (myoblasts and nascent myotubes) should be washed once or twice prior to the addition of fresh complete media. 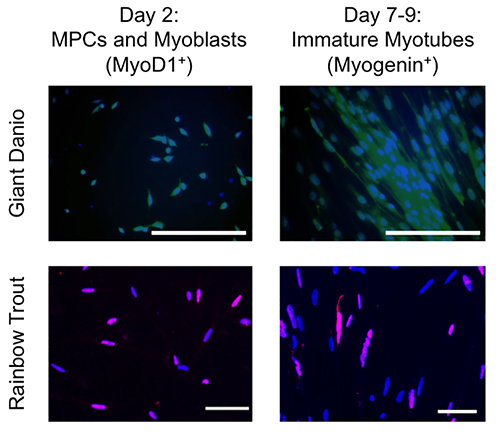 Alternatively, media changes can be reduced to every other day after the cells have reached the definitive myoblast stage (approximately day 4 of culture). Myotubes should form within 2-3 days (Figures 1c and 1f) and be myogenin+ (Figure 2), especially when cultured in differentiation medium (see below). While periods of weeks to months have been reported in several mammalian species, piscine MPCs and myoblasts do not appear to tolerate such periods of time. Cells proliferate for the first six days of culture (Figure 3), with subsequent differentiation between days 7 and 9-11 of culture. Afterward, cells senescence or apoptose. The myogenic nature of MPCs and their progeny isolated using this protocol has been determined3,32,33 based on gene expression. Unlike mammalian culture systems, proliferation of MPCs and myoblast progeny is relatively low during the initial days of culture (when compared to systems utilizing primary murine myoblasts or C2C12), with rapid increases detected as the cells form immature myotubes during days 6-9 of culture in Danio species32. Reports from rainbow trout have utilized a differentiation medium (common in mammalian myoblast cultures, but not required in piscine systems) and indicate that proliferation indices decrease as expected with myotube formation33. In our hands, the resultant myotubes can remain in culture for up to 9-11 days (Danio species) and 11-13 days (Oncorhynchus species) before cellular senescence or apoptosis occurs. Table 1. Detailed reagent list with preferred manufacturer and catalog number. Table 2. Consumables, tools, and equipment needed for cell culture. Table 3. Optimized volumes for coating cell culture plates with poly-L-lysine and laminin. Table 4. Different media preparations for isolation and culture of myogenic precursor cells (MPCs). Table 5. Recommended dilutions and plating volumes by cell culture plate well size. Table 6. 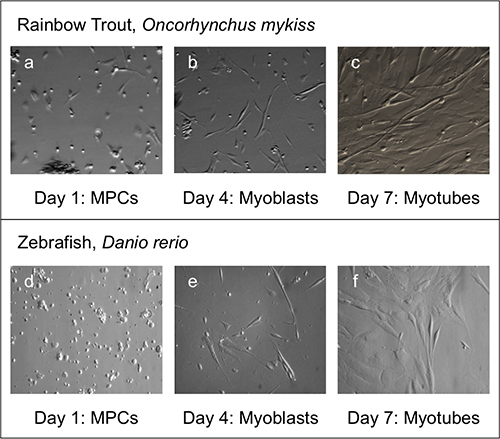 Average number of myogenic precursor cells isolated from 1 gram of muscle tissue from various teleost species: Danio rerio (zebrafish), Daniodangila (moustacheddanio), Devario aequipinnatus (giant danio), and Oncorhynchus mykiss (rainbow trout). * Lower temperatures support lower proliferation rates. Table 7. Recommended incubation temperatures for piscine and amphibian myogenic precursor cells (MPCs). Figure 1. Representative bright field images of MPCs (leftmost), myoblasts (middle), and early myotubes (rightmost) from two species, rainbow trout (Oncorhynchus mykiss, top) and zebrafish (Danio rerio, bottom). Figure 2. Representative immunocytochemical staining of MPCs (a, c) and myotubes (b, d) isolated and cultured from giant danio (Devario aequipinnatus, top) and rainbow trout (Oncorhynchus mykiss, bottom). In culture, myoblasts are MyoD1+ positive (a, c) as visualized using commercially available MyoD1+ antibodies (danio: C-20, Santa Cruz Biotechnology; trout: NB100-80899, Novus Biologicals). Additionally, as myoblasts differentiate, they express myogenin (b, d) as visualized using commercially available myogenin antibodies (danio: M-225; trout: SC-567; both from Santa Cruz Biotechnology). Figure 3. Representative cell proliferation data using BrdU to measure cell proliferation rates over time in culture. Data obtained from MPCs isolated and cultured from giant danio67. The myogenic program, in whichever species examined, can be most easily studied through an in vitro system. Indeed, upon isolation, myogenic precursor cells (MPCs) in fish or myosatellite cells (MSCs) in mammals readily enter this highly regulated process involving the proliferation, cell cycle withdrawal, and terminal differentiation of myoblasts and the fusion of those myoblasts into nascent myotubes. The general lack of transgenic gene reporter strains of piscine species (with the possible exception of the zebrafish67 and rainbow trout69) constrainsin vivo work of MPC/MSC activation, proliferation, and differentiation, and thus the in vitro system presented here is an attractive platform for studies in fish species. Successful culture of MPC/MSCs, no matter the species, is highly dependent on a) rigorous attention to sterility; b) thorough mechanical dissociation of skeletal muscle tissue; and c) optimization of enzymatic digestion. During the initial steps of muscle tissue isolation, great care must be taken to ensure that the necessary quantity of tissue is excised without contamination. It is of utmost importance that fish (or any animals being utilized, for that matter) are properly disinfected in 70% ethanol and for sufficient time. In our hands, 30 seconds works best; shorter periods of time can result in contamination and longer, loss of tissue integrity and cell viability. Ethanol can be used as a fixative, so care must be taken not to dehydrate the fish before dissection. Dissection can be done outside of a laminar flow cell culture hood; however, we recommend that this process be done within a hood to minimize any potential bacterial or fungal contamination. While the mechanical dissociation described above may seem crude and/or tedious at first, it is critical to the isolation procedure. Two large scalpel blades, pulled past each other in a sliding motion (as shown in the video protocol), produces the best results. Once finished, the consistency of the homogenate should be that of a slurry or purée, and easily collected with a wide-bore serological pipette (i.e. 25 ml). Simply, the better the mechanical dissociation, the higher the MPC/MSC yield and the better the resulting culture. Poor dissociation will hinder enzymatic digestion and decrease cell yield. Although it may be tempting to consider, the use of electric tissue homogenizers dramatically lowers cell viability despite its obvious convenience, at least with piscine MPCs. As with all protocols, optimization of the procedure detailed above is often necessary. This has proven true in our work with several danionin species. Results from our laboratory indicate that smaller danionins (e.g. the zebrafish) yield more MPCs per gram of skeletal muscle than do larger species (e.g. giant or moustached danio). However, this is only realized if a higher concentration of collagenase (0.3%) is used with tissue from smaller species. In our hands, a concentration of 0.2% is appropriate for salmonid species (e.g. rainbow trout; cutthroat trout [Oncorhynchusclarki], Chinook salmon [Oncorhynchustschawytscha]), the larger danionins, axolotl (Ambystomamexicanum) limb and tail, and even mouse skeletal muscle. Likewise, care must be taken to select the appropriate collagenase. In our experience, type IV collagenase preserves cell viability far better than collagenases recommended for fibrous tissues such as bone and muscle (i.e. collagenase type II)70. While digestion may be more complete in a shorter time period, cell membrane receptor integrity is likely compromised by increased tryptic activity in these preparations. With respect to trypsin, our laboratory has always utilized the cruder trypsin preparation purified from porcine pancreas, rather than the ‘purer’ preparations available. In our culture activities with various species, we have noticed little beneficial effect of varying trypsin concentrations. Trituration is critical to this protocol. It both dissociates the fibrous matrix of skeletal muscle and increases surface area for tryptic digestion all the while manually disrupting the structural integrity of the myofibers. When performing the triturations, successively using smaller bore pipettes and cannulas is much easier than using the cannula and syringe straightaway. Proceeding directly to triturations with a cannula and syringe can result in plugged cannulas and/or excessive pressure being applied to cells. Applying tryptic digestion without adequate trituration will dramatically reduce cell yields. Once isolated, the culture process is quite straightforward. Most publications to date have utilized a protocol with one media for both proliferation and differentiation33,71-75, including our own; however, more recent articles written by several French investigators have described a two media protocol, with separate based media and serum content for proliferation and differentiation33. This ‘newer’ protocol more closely mimics those used in the culture of murine MSCs and myoblastsand appears to enhance proliferation of early stage myoblasts33 and may be more appropriate to control proliferation and/or differentiation of cells. However, without extensive characterization of gene expression, it is difficult to conclude whether such a ‘proliferation’ media also conserves a more ‘myoblast-like’ state than does the traditional one media methodology. Previous publications describing gene expression, whether at the transcript or protein level, reported using the traditional one media protocol3. Alternatively, a single media (DMEM described herein) can be supplemented with differing concentrations of fetal bovine serum (FBS): 10% for proliferation and 2% for differentiation. While investigators employing mammalian cell culture systems may be acclimated to using carbon dioxide atmospheres for the cultivation of these cells, the intrinsic differences between terrestrial and aquatic gas exchange call for a different approach when culturing piscine or water-confined urodele cells, including MPCs. Media detailed here are buffered with a piperazine-derived, zwitterionic organic compound [HEPES: 4-(2-Hydroxyethyl)piperazine-1-ethanesulfonic acid] and sodium bicarbonate (NaHCO3). Thus, an incubator with gas injection is not needed or required for culture of these cells. More importantly, such incubators should possess the ability to cool rather than heat, as the temperatures needed to culture piscine and urodele MPCs range between 18-26 °C. Further, salmonid MPCs can be cultured at lower temperatures if needed, further highlighting the need for a cooling incubator. Additionally, we have found (as have other investigators, as communicated previously) that sealing of culture plates is necessary to preserve cellular viability. Simply wrapping the interface between the culture lid and plate with standard laboratory tape is sufficient to realize this goal. While passaging of both primary MPCs/MSCs/myoblasts is common in mammalian cell culture, it does not appear to be possible with piscine cells, at least before the late Mb stage (around day 6 of culture). Therefore, the appropriate number of cells sufficient to support proliferation and to reach the goals of the experiment must be seeded at the initiation of the culture. Further, if less than expected cell yields are obtained, it is not possible to propagate cells and then replate the progeny later. We have attributed this characteristic to the increased reliance on the extracellular matrix (ECM) of piscine MPC/myoblasts. Alternatively, it is possible that this is an artifact of the laminin substrate and thus further empirical determination of ECM components necessary for piscine MPC/Mb proliferation and differentiation is warranted. We do note, however, that several of our collaborators have successfully removed late-stage myoblasts (~ day 6 of culture) from the culture substratum and replated these cells (J. M. Froehlich and P. R. Biga, personal communication). Using this protocol or one similar to it, experimentation involving RT-PCR3,71-74,76-78, Western blot32,79-81, immunocytochemistry32,33, proliferation assays32,33,59, gene transfection15, morphometric analysis78, toxicology screening82, and chromatin immunoprecipitation (ChIP; J. M. Froehlich and P. R. Biga, unpublished results) has been done. However, further descriptions of additional in vitro protocols, namely those involving passaging and clonal propagation, are very much needed. Indeed, the Rodgers laboratory15 made significant advancements in the culture of piscine MPCs/myoblasts by optimizing a protocol for inducing transfection of rainbow trout myoblasts. Based on this methodology, further investigations involving RNAi or overexpression of skeletal muscle-specific targets, especially those postulated to be involved with the lifelong growth trajectories of teleost fishes, are not only possible, but may lead to significant advancements in the aquaculture and biomedical fields of science. The authors would like to extend many thanks to Drs. Josep Planas and Juan Castillo for their professional expertise in the development and application of this culture protocol to small fishes and amphibians. Thanks are also due to the countless individuals who have tirelessly assisted with the dissection and dissociation of muscle tissue from many fish (both in species and number), including Matthew Charging, Delci Christensen, Zachary Fowler, Brooke Franzen, Nathan Froehlich, Kira Marshall, Ben Meyer, Ethan Remily, and Sinibaldo Romero. This work was supported by University of Alabama at Birmingham Department of Biology start-up funds, Center for Protease Research NIH Grant # 2P20 RR015566, NIH NIAMS Grant # R03AR055350, and NDSU Advance FORWARD NSF Grant #HRD-0811239 to PRB. Support was also provided by the UAB Nutrition Obesity Research Center award # P30DK056336, NIH NIDDK. Its contents are solely the responsibility of the authors and do not necessarily represent the official views of the NIH. Rescan, P. Y., Gauvry, L., Paboeuf, G. A gene with homology to myogenin is expressed in developing myotomal musculature of the rainbow trout and in vitro during the conversion of myosatellite cells to myotubes. FEBS Letters. 362, (1), 89-92 (1995). Castillo, J., Codina, M., Martinez, M. L., Navarro, I., Gutierrez, J. Metabolic and mitogenic effects of IGF-I and insulin on muscle cells of rainbow trout. American Journal of Physiology. Regulatory, Integrative and Comparative Physiology. 286, (5), 935-941 (2004). Bower, N. I., Johnston, I. A. Paralogs of Atlantic salmon myoblast determination factor genes are distinctly regulated in proliferating and differentiating myogenic cells. American Journal of Physiology. Regulatory, Integrative and Comparative Physiology. 298, (6), 1615-1626 (2010). Funkenstein, B., Balas, V., Skopal, T., Radaelli, G., Rowlerson, A. Long-term culture of muscle explants from Sparus aurata. Tissue & Cell. 38, (6), 399-415 (2006). Cornelison, D. D. Context matters: in vivo and in vitro influences on muscle satellite cell activity. Journal of Cellular Biochemistry. 105, (3), 663-669 (2008). Harris, M. Quantitative growth studies with chick myoblasts in glass substrate cultures. Growth. 21, (3), 149-166 (1957). Cornelison, D. D., Wold, B. J. Single-cell analysis of regulatory gene expression in quiescent and activated mouse skeletal muscle satellite cells. Developmental Biology. 191, (2), 270-283 (1997). Yablonka-Reuveni, Z., et al. The transition from proliferation to differentiation is delayed in satellite cells from mice lacking MyoD. Developmental Biology. 210, (2), 440-455 (1999). Yablonka-Reuveni, Z., Seger, R., Rivera, A. J. Fibroblast growth factor promotes recruitment of skeletal muscle satellite cells in young and old rats. The Journal of Histochemistry and Cytochemistry: Official Journal of the Histochemistry Society. 47, (1), 23-42 (1999). Le Moigne, A., et al. Characterization of myogenesis from adult satellite cells cultured in vitro. The International Journal of Developmental Biology. 34, (1), 171-180 (1990). Tripathi, A. K., Ramani, U. V., Patel, A. K., Rank, D. N., Joshi, C. G. Short hairpin RNA-induced myostatin gene silencing in caprine myoblast cells in vitro. Applied Biochemistry and Biotechnology. 169, (2), 688-694 (2013). Ghahramani Seno,, M, M., et al. Transcriptomic analysis of dystrophin RNAi knockdown reveals a central role for dystrophin in muscle differentiation and contractile apparatus organization. BMC Genomics. 11, 345 (2010). Honda, M., Hosoda, M., Kanzawa, N., Tsuchiya, T., Toyo-oka, T. Specific knockdown of delta-sarcoglycan gene in C2C12 in vitro causes post-translational loss of other sarcoglycans without mechanical stress. Molecular and Cellular Biochemistry. (1-2), 323-321 (2009). Rochard, P., et al. Mitochondrial activity is involved in the regulation of myoblast differentiation through myogenin expression and activity of myogenic factors. The Journal of Biological Chemistry. 275, (4), 2733-2744 (2000). Jackson, M. F., Hoversten, K. E., Powers, J. M., Trobridge, G. D., Rodgers, B. D. Genetic manipulation of myoblasts and a novel primary myosatellite cell culture system: comparing and optimizing approaches. The FEBS Journal. 280, (3), 827-839 (2013). McGrew, M. J., Rosenthal, N. Transgenic analysis of cardiac and skeletal myogenesis. Trends in Cardiovascular Medicine. 4, (6), 251-256 (1994). Dong, Y., Pan, J. S., Zhang, L. Myostatin suppression of Akirin1 mediates glucocorticoid-induced satellite cell dysfunction. PLoS ONE. 8, (3), (2013). Chen, Y., Melton, D. W., Gelfond, J. A., McManus, L. M., Shireman, P. K. MiR-351 transiently increases during muscle regeneration and promotes progenitor cell proliferation and survival upon differentiation. Physiological Genomics. 44, (21), 1042-1051 (2012). Shadrach, J. L., Wagers, A. J. Stem Cells for skeletal muscle repair. Philosophical Transactions of the Royal Society of London. Series B, Biological Sciences. 366, (1575), 2297-2306 (2011). Wu, X., Wang, S., Chen, B., An, X. Muscle-derived stem cells: isolation, characterization, differentiation, and application in cell and gene therapy. Cell and Tissue Research. 340, (3), 549-567 (2010). Farini, A., Razini, P., Erratico, S., Torrente, Y., Meregalli, M. Cell based therapy for Duchenne muscular dystrophy. Journal of Cellular Physiology. 221, (3), 526-534 (2009). Kim, H. J., Archer, E., Escobedo, N., Tapscott, S. J., Unguez, G. A. Inhibition of mammalian muscle differentiation by regeneration blastema extract of Sternopygus macrurus. Developmental Dynamics: an Official Publication of the American Association of Anatomists. 237, (10), 2830-2843 (2008). McGann, C. J., Odelberg, S. J., Keating, M. T. Mammalian myotube dedifferentiation induced by newt regeneration extract. Proceedings of the National Academy of Sciences of the United States of America. 98, (24), 13699-13704 (2001). Cosgrove, B. D., Sacco, A., Gilbert, P. M., Blau, H. M. A home away from home: challenges and opportunities in engineering in vitro muscle satellite cell niches. Differentiation; Research in Biological Diversity. 78, (2-3), 2-3 (2009). Colbert, D. A., Edwards, K., Coleman, J. R. Studies on the organisation of the chicken genome and its expression during myogenesis in vitro. Differentiation; Research in Biological Diversity. 5, (2-3), 91-96 (1976). Bowman, L. H., Emerson, C. P. Post-transcriptional regulation of ribosome accumulation during myoblast differentiation. Cell. 10, (4), 587-596 (1977). Sun, S. S., McFarland, D. C., Ferrin, N. H., Gilkerson, K. K. Comparison of insulin-like growth factor interaction with satellite cells and embryonic myoblasts derived from the turkey. Comparative Biochemistry and Physiology. Comparative Physiology. 102, (2), 235-243 (1992). Marusich, M. F., Simpson, S. B. Changes in cell surface antigens during in vitro lizard myogenesis. Developmental Biology. 97, (2), 313-328 (1983). Schrag, J. A., Cameron, J. A. Regeneration of adult newt skeletal muscle tissue in vitro. Journal of Embryology and Experimental Morphology. 77, 255-271 (1983). Hinkle, L., McCaig, C. D., Robinson, K. R. The direction of growth of differentiating neurones and myoblasts from frog embryos in an applied electric field. The Journal of Physiology. 314, 121-135 (1981). Yamane, H., Nishikawa, A. Differential muscle regulatory factor gene expression between larval and adult myogenesis in the frog Xenopus laevis: adult myogenic cell-specific myf5 upregulation and its relation to the notochord suppression of adult muscle differentiation. In vitro Cellular & Developmental Biology Animal. (2013). Alexander, M. S., et al. Isolation and transcriptome analysis of adult zebrafish cells enriched for skeletal muscle progenitors. Muscle & Nerve. 43, (5), 741-750 (2011). Froehlich, J. M., Galt, N. J., Charging, M. J., Meyer, B. M., Biga, P. R. In vitro indeterminate teleost myogenesis appears to be dependent on Pax3. In vitro Cellular & Developmental Biology Animal. (2013). Gabillard, J. C., Sabin, N., Paboeuf, G. In vitro characterization of proliferation and differentiation of trout satellite cells. Cell and Tissue Research. 342, (3), 471-477 (2010). Blau, H. M., Chiu, C. P., Webster, C. Cytoplasmic activation of human nuclear genes in stable heterocaryons. Cell. 32, (4), 1171-1180 (1983). Yaffe, D. Retention of differentiation potentialities during prolonged cultivation of myogenic cells. Proceedings of the National Academy of Sciences of the United States of America. 61, (2), 477-483 (1968). Yaffe, D., Saxel, O. Serial passaging and differentiation of myogenic cells isolated from dystrophic mouse muscle. Nature. 270, (5639), 725-727 (1977). Antin, P. B., Ordahl, C. P. Isolation and characterization of an avian myogenic cell line. Developmental Biology. 143, (1), 111-121 (1991). Malatesta, M., Giagnacovo, M., Cardani, R., Meola, G., Pellicciari, C. Human myoblasts from skeletal muscle biopsies: in vitro culture preparations for morphological and cytochemical analyses at light and electron microscopy. Methods in Molecular Biology. 976, 67-79 (2013). Scott, I. C., Tomlinson, W., Walding, A., Isherwood, B., Dougall, I. G. Large-scale isolation of human skeletal muscle satellite cells from post-mortem tissue and development of quantitative assays to evaluate modulators of myogenesis. Journal of Cachexia, Sarcopenia and Muscle. 10-1007 (2013). Baquero-Perez, B., Kuchipudi, S. V., Nelli, R. K., Chang, K. C. A simplified but robust method for the isolation of avian and mammalian muscle satellite cells. BMC Cell Biology. 13, (2012). Lu, A., et al. Isolation of myogenic progenitor populations from Pax7-deficient skeletal muscle based on adhesion characteristics. Gene Therapy. 15, (15), 1116-1125 (2008). Rouger, K., et al. Progenitor cell isolation from muscle-derived cells based on adhesion properties. The Journal of Histochemistry and Cytochemistry: Official Journal of the Histochemistry Society. 55, (6), 607-618 (2007). Michal, J., et al. Isolation and characterization of canine satellite cells. In vitro cellular & Developmental Biology Animal. 38, 467-480 (2002). McFarland, D. C., et al. Isolation and characterization of myogenic satellite cells from the muscular dystrophic hamster. Tissue & Cell. 32, (3), 257-265 (2000). Burton, N. M., Vierck, J., Krabbenhoft, L., Bryne, K., Dodson, M. V. Methods for animal satellite cell culture under a variety of conditions. Methods in Cell Science: an Official Journal of the Society for In vitro Biology. 22, (1), 51-61 (2000). Pavlath, G. K. Isolation, purification, and growth of human skeletal muscle cells. Methods in Molecular Medicine. 2, 307-317 (1996). Rosenblatt, J. D., Lunt, A. I., Parry, D. J., Partridge, T. A. Culturing satellite cells from living single muscle fiber explants. In vitro Cellular & Developmental Biology. Animal. 31, (10), 773-779 (1995). Doumit, M. E., Merkel, R. A. Conditions for isolation and culture of porcine myogenic satellite cells. Tissue & Cell. 24, (2), 253-262 (1992). Barjot, C., Jbilo, O., Chatonnet, A., Bacou, F. Expression of acetylcholinesterase gene during in vitro differentiation of rabbit muscle satellite cells. Neuromuscular Disorders: NMD. 3, (5-6), 443-446 (1993). Pasut, A., Oleynik, P., Rudnicki, M. A. Isolation of muscle stem cells by fluorescence activated cell sorting cytometry. Methods in Molecular Biology. 798, 53-64 (2012). Danoviz, M. E., Yablonka-Reuveni, Z. Skeletal muscle satellite cells: background and methods for isolation and analysis in a primary culture system. Methods in Molecular Biology. 798, 21-52 (2012). Musaro, A., Barberi, L. Isolation and culture of mouse satellite cells. Methods in Molecular Biology. 633, 101-111 (2010). Sherwood, R. I., et al. Isolation of adult mouse myogenic progenitors: functional heterogeneity of cells within and engrafting skeletal muscle. Cell. 119, (4), 543-554 (2004). Yi, L., Rossi, F. Purification of progenitors from skeletal muscle. J. Vis. Exp. (49), (2011). Tamaki, T., et al. Skeletal muscle-derived CD34+/45- and CD34-/45- stem cells are situated hierarchically upstream of Pax7+ cells. Stem Cells and Development. 17, (4), 653-667 (2008). Bosnakovski, D., et al. Prospective isolation of skeletal muscle stem cells with a Pax7 reporter. Stem Cells. 26, (12), 3194-3204 (2008). Montarras, D., et al. Direct isolation of satellite cells for skeletal muscle regeneration. Science. 309, (5743), 2064-2067 (2005). Powell, R. L., Dodson, M. V., Cloud, J. G. Cultivation and differentiation of satellite cells from skeletal muscle of the rainbow trout Salmo gairdneri. Journal of Experimental Zoology. 250, (3), 333-338 (1989). Fauconneau, B., Paboeuf, G. Effect of fasting and refeeding on in vitro muscle cell proliferation in rainbow trout (Oncorhynchus mykiss). Cell and Tissue Research. 301, (3), 459-463 (2000). Rescan, P. Y. Muscle growth patterns and regulation during fish ontogeny. General and Comparative Endocrinology. 142, (1-2), 111-116 (2005). Johnston, I. A., Bower, N. I., Macqueen, D. J. Growth and the regulation of myotomal muscle mass in teleost fish. The Journal of Experimental Biology. 214, 1617-1628 (2011). Mommsen, T. P. Paradigms of growth in fish. Comparative Biochemistry and Physiology. Part B, Biochemistry & Molecular Biology. 129, (2-3), 207-219 (2001). Biga, P. R., Goetz, F. W. Zebrafish and giant danio as models for muscle growth: determinate vs. indeterminate growth as determined by morphometric analysis. American Journal of Physiology. Regulatory, Integrative and Comparative Physiology. 291, (5), 1327-1337 (2006). Roy, S., Gatien, S. Regeneration in axolotls: a model to aim for! Experimental Gerontology. 43, (11), 968-973 (2008). Echeverri, K., Tanaka, E. M. Ectoderm to mesoderm lineage switching during axolotl tail regeneration. Science. 298, (5600), 1993-1996 (2002). Tanaka, E. M., Reddien, P. W. The cellular basis for animal regeneration. Developmental Cell. 21, (1), 172-185 (2011). Froehlich, J. M., Galt, N. J., Charging, M. J., Meyer, B. M., Biga, P. R. In vitro indeterminate teleost myogenesis appears to be dependent on Pax3. In vitro Cellular & Developmental Biology Animal. 49, (5), 371-385 (2013). Seger, C., et al. Analysis of Pax7 expressing myogenic cells in zebrafish muscle development, injury, and models of disease. Developmental Dynamics: an Official Publication of the American Association of Anatomists. 240, (11), 2440-2451 (2011). Gabillard, J. C., Ralliere, C., Sabin, N., Rescan, P. Y. The production of fluorescent transgenic trout to study in vitro myogenic cell differentiation. BMC Biotechnology. 10, (2010). Bond, M. D., Van Wart, H. E. Purification and separation of individual collagenases of Clostridium histolyticum using red dye ligand chromatography. Biochemistry. 23, (13), 3077-3085 (1984). Garikipati, D. K., Rodgers, B. D. Myostatin inhibits myosatellite cell proliferation and consequently activates differentiation: evidence for endocrine-regulated transcript processing. The Journal of Endocrinology. 215, (1), 177-187 (2012). Sanchez-Gurmaches, J., Cruz-Garcia, L., Gutierrez, J., Navarro, I. mRNA expression of fatty acid transporters in rainbow trout: in vivo and in vitro regulation by insulin, fasting and inflammation and infection mediators. Comparative Biochemistry and Physiology. Part A, Molecular & Integrative Physiology. 163, (2), 177-188 (2012). Garikipati, D. K., Rodgers, B. D. Myostatin stimulates myosatellite cell differentiation in a novel model system: evidence for gene subfunctionalization. American Journal of Physiology. Regulatory, Integrative and Comparative Physiology. 302, (9), 1059-1066 (2012). Vraskou, Y., et al. Direct involvement of tumor necrosis factor-α in the regulation of glucose uptake in rainbow trout muscle cells. American Journal of Physiology. Regulatory, Integrative and Comparative Physiology. 300, (3), 716-723 (1152). Cleveland, B. M., Weber, G. M. Effects of insulin-like growth factor-I, insulin, and leucine on protein turnover and ubiquitin ligase expression in rainbow trout primary myocytes. American Journal of Physiology. Regulatory, Integrative and Comparative Physiology. 298, (2), 341-350 (2010). Seiliez, I., et al. Amino acids downregulate the expression of several autophagy-related genes in rainbow trout myoblasts. Autophagy. 8, (3), 364-375 (2012). Chapalamadugu, K. C., et al. Dietary carbohydrate level affects transcription factor expression that regulates skeletal muscle myogenesis in rainbow trout. Comparative Biochemistry and Physiology. Part B, Biochemistry & Molecular Biology. 153, (1), 66-72 (2009). Seiliez, I., et al. Myostatin induces atrophy of trout myotubes through inhibiting the TORC1 signaling and promoting Ubiquitin-Proteasome and Autophagy-Lysosome degradative pathways. General and Comparative Endocrinology. 186, 9-15 (2013). Codina, M., et al. Metabolic and mitogenic effects of IGF-II in rainbow trout (Oncorhynchus mykiss) myocytes in culture and the role of IGF-II in the PI3K/Akt and MAPK signalling pathways. General and Comparative Endocrinology. 157, (2), 116-124 (2008). Seiliez, I., Sabin, N., Gabillard, J. C. Myostatin inhibits proliferation but not differentiation of trout myoblasts. Molecular and Cellular Endocrinology. 351, (2), 220-226 (2012). Averous, J., Gabillard, J. C., Seiliez, I., Dardevet, D. Leucine limitation regulates myf5 and myoD expression and inhibits myoblast differentiation. Experimental Cell Research. 318, (3), 217-227 (2012). Fauconneau, B., Paboeuf, G. Sensitivity of muscle satellite cells to pollutants: an in vitro and in vivo comparative approach. Aquatic Toxicology. 53, (3-4), 247-263 (2001).